The test targeted and destroyed one of India’s own satellites operating in low-Earth orbit (LEO). A press release, rather an FAQ issued by the Ministry of External Affairs, claimed that the test was “fully successful” and achieved all mission objectives. It is not clear when India’s ASAT program started but it is safe to assume that it began after the first successful Chinese ASAT test in January 2007. Going by the statements issued by scientists, ministers, as well as military leaders, it is clear that China’s ASAT was a big factor. The previous government of the United Progressive Alliance (UPA) led by the Congress party has indeed taken credit for starting the program. Former Defense Research and Development Organization (DRDO) officials like Dr. V.K. Saraswat had previously stated that India had developed the technological blocks for an ASAT demonstration but lacked the political will to demonstrate the capability. Traditionally, India’s space program focused largely on civilian and developmental uses but has increasingly had a national security and strategic focus also. Over the last decade, India has deployed a number of satellites with specific national security roles in surveillance as well as military communication. It launched the first dedicated military satellite for the Indian Navy in 2013. This was the result not just of India’s growing technological capacity but also of the increasing competition in the space arena. China’s efforts to catch up with the United States in outer space, while understandable, also have a second-order impact on India’s national security. And China’s power in both Asia and particularly in South Asia means that New Delhi could not ignore China’s capabilities, including in outer space. Terrestrial conflict and competition have begun to impact outer space activities too, much as during the Cold War between the United States and the Soviet Union. 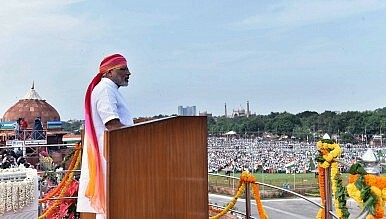 In addition, India has also felt the need to conduct spectacular space operations to demonstrate its capabilities. These help demonstrate India’s achievements and possibly give it a bigger voice in international discussions about managing outer space. Though international management of outer space is beginning to fray, with more players, more challenges, and greater nationalism, this is all the more reason for countries like India to make efforts to re-establish some of the norms and rules of managing outer space. But developing technological capabilities is only one dimension of the challenges India faces. An equally serious challenge is building the institutional apparatus within the government to use these capabilities in the most effective manner possible. To take just one example, the Indian government established the Integrated Space Cell more than a decade ago, which was a good first step, but the Cell has not been able to perform the kind of integrative functions it was originally meant to. Similarly, the establishment of a triservice aerospace command has been debated for two decades with no real progress. The idea was first articulated by Air Chief Marshal SK Sareen back in 1998 when he headed the Indian Air Force (IAF). Two decades later, India is getting closer to having a Defense Space Agency but not yet a Command. Many in the IAF leadership have argued that the changing nature of warfare, with greater integration of space capabilities as seen during the U.S. military operations in Iraq and Afghanistan, should be clear imperatives for India to proceed with institutional changes. Moreover, other countries like China are learning from United States’ operations and reorienting their own space programs. But India has not progressed much in developing an integrated approach to outer space or creating the institutional architecture to ensure greatest effectiveness and efficiency. This task, in fact, may be harder than just developing technology, which is one reason why this has not kept pace with technological developments. Another area where New Delhi must change is with regard to its involvement in global space governance. India so far has been quite reluctant to get involved in space governance or in the debates about its future. Having demonstrated its ASAT capability, India should not shy away from playing an active role in ensuring that outer space remains peaceful, without weapons, and developing mechanisms that would curb certain irresponsible actions in outer space. At the very least, India should take the lead in shaping the norms of responsible behavior even if formulating legally binding mechanisms are challenging given that developing consensus among major spacefaring powers has been the biggest challenge in this regard.